Future commercial development will result in Route 535 relocating both eastbound and westbound service to LBJ Freeway (Interstate Highway 635) service roads between Webb Chapel Road and Josey Lane, effective Monday, October 23, 2017. 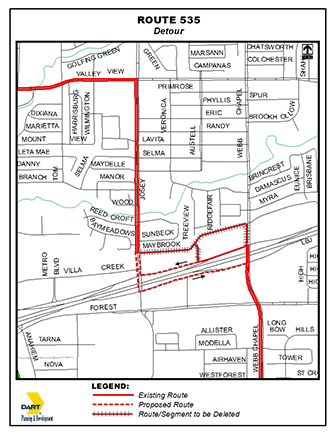 Buses will no longer operate along Maybrook or Treeview in either direction (please see map below). The schedule will remain unaffected. Thanks for riding DART.